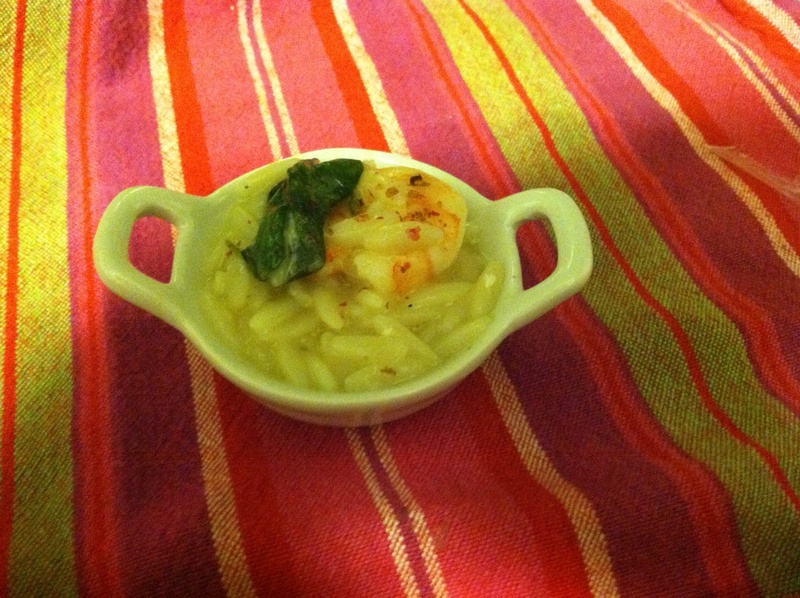 Last night I was planning on making a beautiful shrimp and lemon risotto. It’s something that I make every once in a while, but it takes a bit of planning, a lot of stirring and Will loves it. But I got distracted, and dinnertime caught up with me. Then I got a take out recommendation from a friend…but really…we’re trying to be a little better with our FABULOUS lifestyle…so I wanted to make something special, that tasted decadent, but was all made from what I already had. I warmed up a saute pan with olive oil on a medium-high burner and had Zara add the minced garlic and orzo. Zara stirred until the orzo was coated with oil, about 2 minutes. She then added the chicken stock and let the mixture simmer for 8 minutes. She then added the butter while I squeezed the lemon into the mixture (beware of the pips!). Z stirred well, while I reduced the heat to low. Now let the mixture simmer another 8 minutes. You should see that the liquid is greatly reduced. Next I added shrimp and spinach, Z stirred and I covered the pan making sure there was a little room for the steam to escape. We checked 4 minutes later. The liquid had almost reduced and the shrimp were pink. I let Zara liberally throw in cheese and I turned off the heat. We stirred through and then tasted. Salt and pepper as you like (I add lots of pepper and no salt because of the stock and cheese). It has that creamy butter lemon sauce that coats the orzo and shrimp and the cheese incorporates the spinach without making it taste wilted (even though it’s wilted). It was a fantastic valentine’s day meal, even if I hadn’t planned it! I served with a sweet potato and wine (of course!). Z had it with a hot dog and some carrots.